Aloha! Welcome to a dinner that will indulge your taste buds, satisfy your hunger, and transport you to an evening on the islands. From the impressive pineapple boat presentation to the vivid colors, this entree is as beautiful to look at as it is amazing to eat! 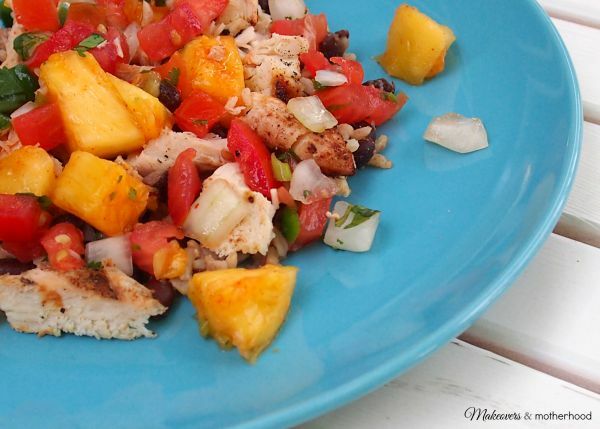 Luau Boats brimming with grilled chicken, fresh pico de gallo and pineapple, over a bed of rice and beans is a well balanced meal that will turn your table into a Hawaiian oasis. I love adding ambiance to meals. We often have family date night with the lights dimmed low and the glow of candlelight for mood lighting. On nights we eat Mexican, I’ll spread out a table runner from Mexico, pour the salsa into dishes shaped like a chili pepper, and turn on Mariachi music. 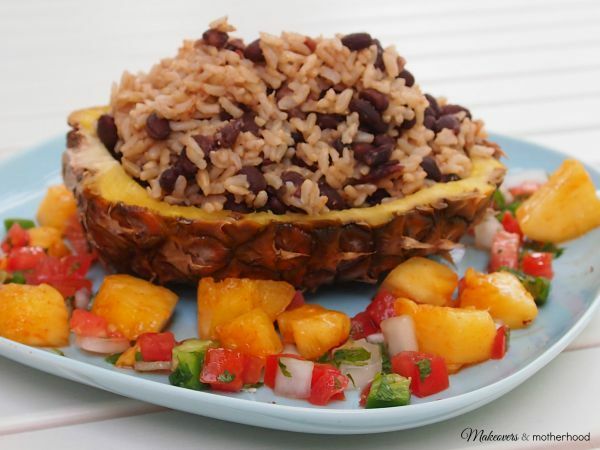 So you can imagine how much I love serving a meal out of pineapples and streaming island music online! To be honest, my hubby and I had a version of this meal at a little restaurant on the Lakefront trail downtown Chicago. The description on the menu sounded delectable and we were both impressed and excited when a pineapple boat of food arrived at the table. However, a couple bites in and our excitement waned. The food was bland. Very bland. So I took the personal challenge to make this meal the impressive, fun one I knew it could be. 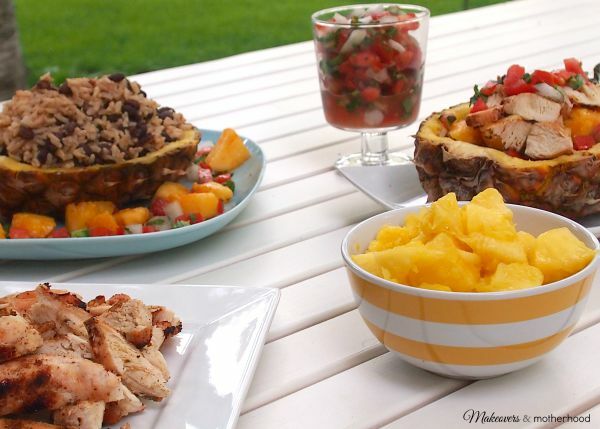 Bursting with bold flavor, this meal has become a summer staple for us and been served to several guests that have graced our table… receiving compliments from them all. While you can serve each person with a personal pineapple boat, I would suggest using the empty pineapple shells as serving bowls. Otherwise, you’ll be eating pineapple for months! Only a special occasion at our home would call for one’s own personal luau boat. For instance, on Father’s Day I served the Big Kahuna of our family from his own pineapple. Or consider doing this for a guest of honor (birthday, graduation, etc). Serving each food separately also allows each person to customize their plate/eating style. We’ve noticed some of our guests prefer to keep each food separated on their plate and go at it like a meat with sides. For me though, I go with the Hawaiian mixed plate concept… pile it all together! 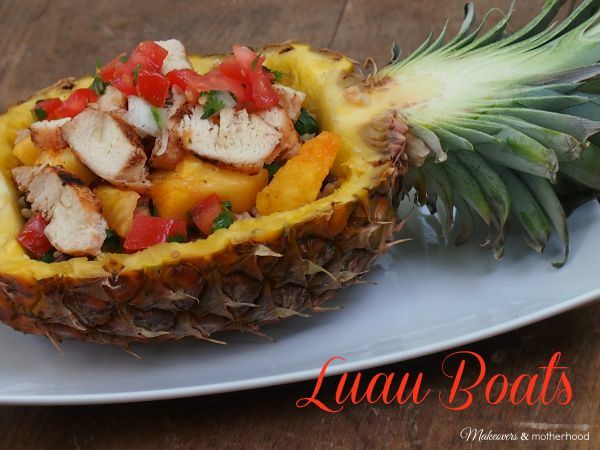 Whether it’s a regular weeknight meal or the feast you’re serving up at a backyard luau, this meal is all about presentation and fun! So get out the Hawaiian shirts and grass skirts and enjoy! While rice is cooking, do all the prep work for the rest of the meal. Slice whole pineapple in half, including the green bushy stem. Cut around the inside of the pineapple and using a spoon, try to dig out the meat of the pineapple in large chunks. Divide up the pineapple, if desired. Since not everyone likes spicy, I keep half of the pineapple plain. For spicy pineapple, put pineapple in bowl. Pour rum over pineapple until 1/3 of it is sitting in rum. Pour hot sauce over the top of pineapple. Stir well. Sit and let marinade. Once rice is finished cooking, add black beans to the pot/pan. I also add a couple Tbsps of rum and/or drain off the excess hot sauce/rum marinade over the rice & beans. Season chicken with Caribbean Jerk seasoning and grill. Wait until everything is cooked to scoop into pineapple boats to keep it all warm. Quick note on buying pineapples… Aldi is by far the cheapest place to buy a whole pineapple. With the price coming in under $2, it makes many grocers look sad with their prices of $3.50. Ouch! And as much as we’ve been consuming this meal, I’m all about saving that little extra.